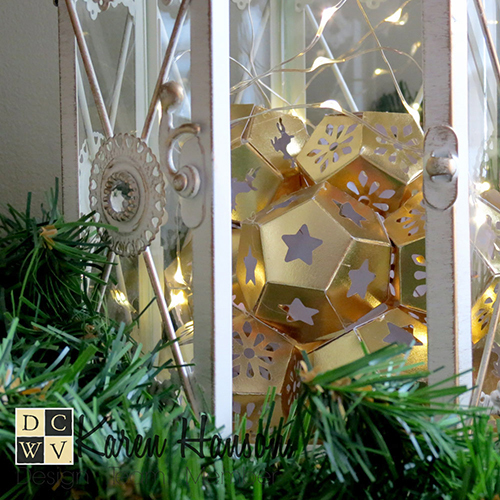 A Lantern Project for the holidays! Hi everyone. 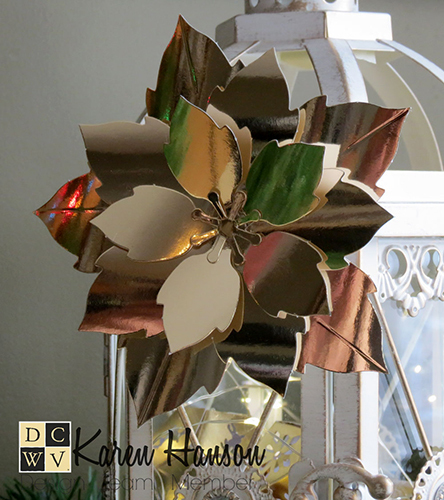 It’s Social Media Design team member Karen H., and today I am here with a home décor project for you just in time for the holidays! I have to admit that I am a little bit “eclectic” when it comes to holiday decorating. My collection of Christmas decorations certainly wouldn’t make for a good Christmas window display – all matched and complimentary. But every piece has a memory, and every piece says something about me and my family. Today’s addition is not different! 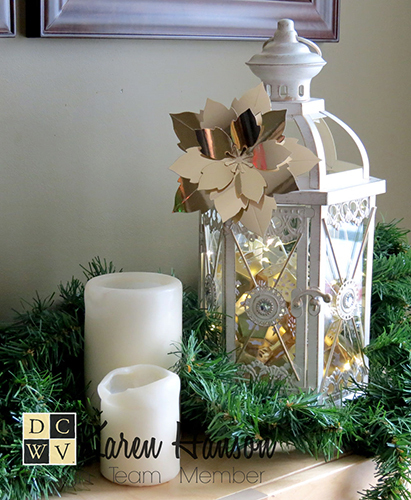 I recently got my hands on DCWV’s 12x12” Light Up stack – Wreath and Garland, and I cannot tell you how excited I was! Not only was it filled with easy to punch out and fold pieces to make a banner and a wreath, but it also had two strands of lights!!! Yup – lights! Now, I certainly didn’t need another banner in my house (I really like making banners so there is no shortage), but I thought I would play with using the stack in a bit of a different way. Instead, I decided to fold up a few of the components and use them to decorate up a lantern that I had. The stack has these great litter orbs that you can fold, and I used them inside the lantern with one of the strings of lights. There are 10 orbs total inside my lantern, but the number you would need would depend on the size of your lantern (the stack had more than the number I used). My initial intention was actually to hang the orbs from the top, but my lantern was a little too ornate to actually see what was going on inside. But if you do have a lantern with a clean and simple design, I highly recommend giving that a try! To top it off (literally), I folded up one of the beautiful poinsettia-inspired flowers, added a magnet and popped it onto the outside of the lantern. Because of magnet, I can take it off and repurpose the lantern for a different season and then add the flower back on again next Christmas! While I am not sure exactly where my lantern will make its home at this point, I am excited that I get to bring paper crafts into the season! Heaven knows there is enough paper in my house – it will fit right in.